Native & Search provides you with the capability to view the history of changes made to your account. That means, you can better understand and monitor the changes that may have affected your account’s performance. Using various filters, you can narrow down the changes made to a particular entity. You can also view changes made to a specific entity by clicking into the context of that entity. This enhancement lets you view the changes you’ve made within the last 3 months to your account. Navigate to Tools > Change History in the Native & Search UI. To view changes for a specific date range, select the dates in the upper right corner. You can go back up to 3 months. To view details of a change, click the arrow next to the change. To filter your change history, click Filters. Select a filter from the dropdown. The Change Type filter offers a list of attribute filters to choose from. 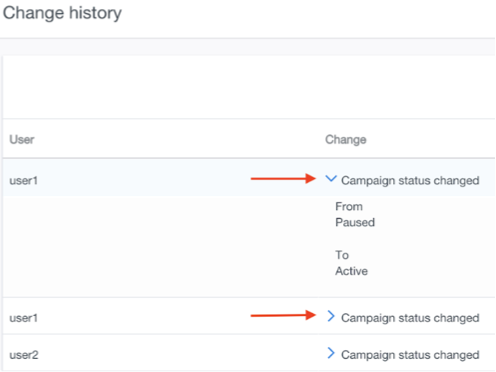 To view the change history in-context of a campaign, you can drill down from the Change History page into the campaign. Clicking the link takes you to the change history for the campaign. The change history is also available within the Manage ads tab in-context of the entity.